The fracking boom helped push the Permanent University Fund close to $20 billion, and every year the UT System gets a slice of that money to spend — but just a sliver goes to student financial aid. Oil and gas extracted from state land in West Texas has helped create unprecedented wealth for the University of Texas System. On a square of dirt surrounded by sun-scorched grassland, hundreds of miles from Austin, a huge iron pumpjack creaks up and down. It runs 24 hours a day, seven days a week, generating as much as $7,000 worth of oil per day. It’s surrounded by thousands of others, drawing from billions of dollars’ worth of oil and gas under this ground, which is all controlled by the University of Texas System. And thanks to the fracking boom, workers are pulling out far more oil from each square of West Texas dirt — millions of gallons a day. Each barrel pulled from the ground adds a few more dollars to the Permanent University Fund, a $19.5 billion pot that supports an endowment for the UT and Texas A&M University systems. In recent years, the annual cash payout from this oil fund has exploded: In 2011, the UT System — which oversees UT-Austin and 13 other campuses — received $352 million from the fund. This year, it will receive $603 million, and about half will flow directly to its flagship campus in Austin (the Texas A&M System will receive about $300 million). That has helped UT System become one of the richest educational institutions in the world, part of a rarefied club that includes Harvard, Yale and Stanford. But unlike the other members of the club, the UT System is a public institution and must disclose how it spends the money. Those disclosures show that the wealth hasn’t created a windfall for students. The money that filters down to them in the form of financial aid amounts to a trickle of roughly $40 million. That includes about $3 million for UT-Austin’s 40,000 undergraduates, and approximately $35 million for its graduate students. $215 million to buy 300 acres of empty land in Houston, with no concrete plans for how to use it. After a political backlash, the system now says it plans to sell the land. $100 million devoted to an in-house educational technology startup that has struggled to meet its goals. $141 million on a new 17-story office tower in expensive downtown Austin to house hundreds of system employees. All those dollars could have otherwise gone directly to UT-Austin, which has seen its financial support from the state decline and has raised its annual tuition by $1,500 since 2010. UT System leaders say they are being smart with the oil money. State law imposes some spending limits, and they say their administrative expansion has meant big savings for UT campuses by consolidating expensive services. But many state leaders, and some members of the system’s own governing board, have begun questioning how all those millions are being spent. “It looks to me like an entity that has a lot more money than they know what to do with,” Sen. Kel Seliger, R-Amarillo, chairman of the Senate Higher Education Committee, told UT’s chancellor during a tense committee hearing in January. The nine-member UT Board of Regents, which approved all those big-ticket expenditures in recent years, will meet this week. Since a group of more skeptical regents joined the board this spring, many members have signaled that they’re ready to rein in the system’s spending. “There’s a very significant and growing top-down, expensive architecture that … provides, I believe, very little, if any, return on investment,” Regent Janiece Longoria said during a meeting this May. The complaints have created a tense situation for UT System Chancellor Bill McRaven, who has defended many of the big-ticket projects and whose contract expires in January. This week he will tell regents that he wants to cut $15 million from the system administration’s budget. Even then, the budget will be three times what it was in 2011. UT gained access to its oil riches more than 140 years ago, though no one knew at the time. In 1876, when Texas ratified the sixth and current version of its Constitution, the authors ordered the state to create a “university of the first class.” Over the next few years, the state set aside 2.1 million acres in West Texas to help fund an endowment for the new school. At the time, the land — which covers an area larger than Delaware and Rhode Island combined — seemed like little more than useless brushland that could barely support cattle grazing. But after oil was discovered in Texas in 1901, UT System leaders began to suspect there was oil under their West Texas ground. In 1923, a wildcatter named Frank Pickrell was the first to strike at a well called Santa Rita No. 1, kicking off a rush that hasn’t stopped since. These days, the university land is just as hot and dry, but not nearly as sparse. Hundreds of oil wells dot the horizon, surrounded by networks of dirt roads, pipelines and big man-made pools of water. Now that the fracking boom has caused a new oil rush in West Texas, more than 7,000 roughnecks, drillers and truck drivers trudge out of hotels and portable buildings each morning to work on the land. As the oil and gas flows into pipelines, the money flows into the Permanent University Fund, which has grown from $10.7 billion in 2010 to $19.5 billion today. The system preserves the fund for the long-term by spending only a small fraction of it every year. Still, that amounts to $603 million for the UT System alone in 2017 — more than the Legislature spends on its main financial aid program for low-income students across the state. The Texas Constitution says the UT System can only spend the oil money on capital projects and administration. Whatever the system doesn’t use goes to UT-Austin, which is free to spend it on whatever it wants. But the university spends only a small fraction of the money on student financial aid. Experts who’ve looked at the scant information available on private universities say they probably use their endowment funds the same way. Universities faced grim financial news in 2011 as state lawmakers passed historic budget cuts — including more than a half billion dollars from higher education. 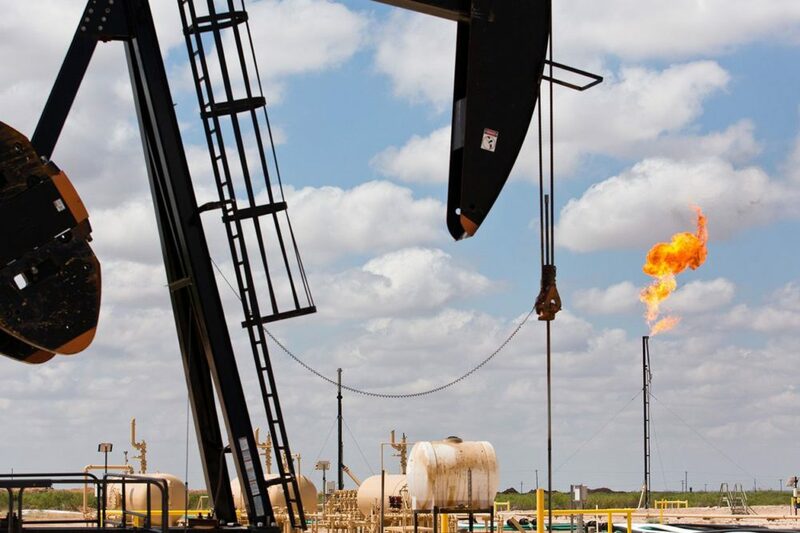 But thanks to the oil boom and some good investments, the UT System learned the oil fund would deliver a record cash payout of $400 million in the coming year. Flush with that new cash, administrators found new ways to spend it. Hoping to unite system leaders behind a new vision for the future of higher education in Texas, Chancellor Francisco Cigarroa locked himself in his official residence with a group of advisors for nearly two days. He emerged with what he called a “Framework for Excellence” for the system — one that would largely be financed by the oil fund. The framework had nine “planks,” including improving science education, building new research centers, hiring new faculty and developing online learning tools. All nine regents approved the plan without asking a single question, and they gave Cigarroa an initial investment of $244 million to implement it. The plan was seen as so visionary that Cigarroa was invited to the White House to talk about it — twice. 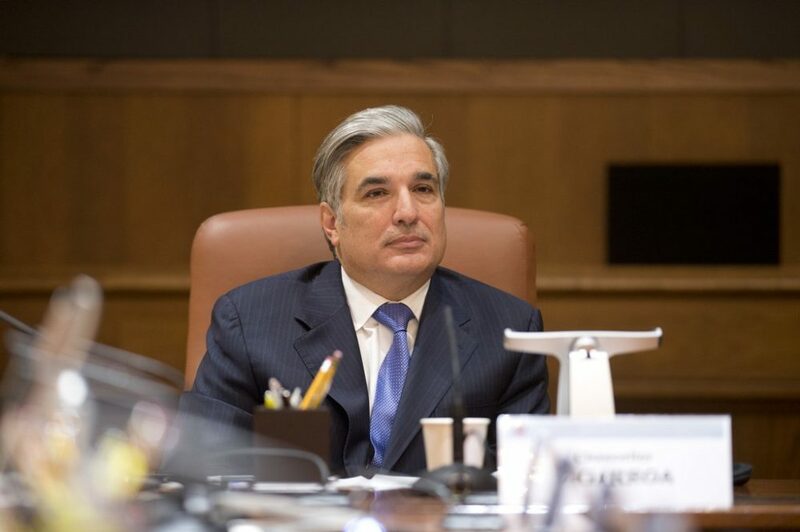 Former University of Texas System Chancellor Francisco Cigarroa at a Board of Regents meeting in 2013.
l instead go back to its old online platform from an outside vendor. As a result, the memo says, “students will likely incur additional costs.” It’s not clear how much. Costs had already been going up for students. In 2016, the regents approved tuition increases at all the system’s campuses. At UT-Austin, that increase was projected to raise $30 million. Richard Vedder, a professor and expert on college endowments from Ohio University, said that many universities have spent their wealth on initiatives like the Institute for Transformational Learning. Today, after six years and about $50 million of UT System money spent, enthusiasm for the institute among many of the regents is waning fast. Soon after that meeting, the institute’s top two executives resigned. In retrospect, system leaders say that the initial vision might have been too ambitious. “There was not the foundation of a business plan at the time [the institute was launched],” said Steve Leslie, a UT System vice chancellor who began overseeing the institute in 2015. The institute is still working on a plan to achieve financial sustainability, Leslie said. Preliminary budget documents suggest that the institute will face cuts, but don’t specify how much. Meanwhile, its next big play — a redesigned cybersecurity program at the University of Texas at San Antonio — is set to launch this fall. Leslie said the best is yet to come for the institute. “It was expensive,” he said. “But it led to where we are now, which has also been expensive. Cigarroa stepped down in early 2015. The regents tapped McRaven, a UT-Austin graduate and retired Navy admiral, to take his place. He had no higher education experience, but his hiring generated a lot of buzz. He’d orchestrated the famous Navy SEAL raid that killed Osama Bin Laden. And McRaven was passionate about cutting bureaucracy and red tape. 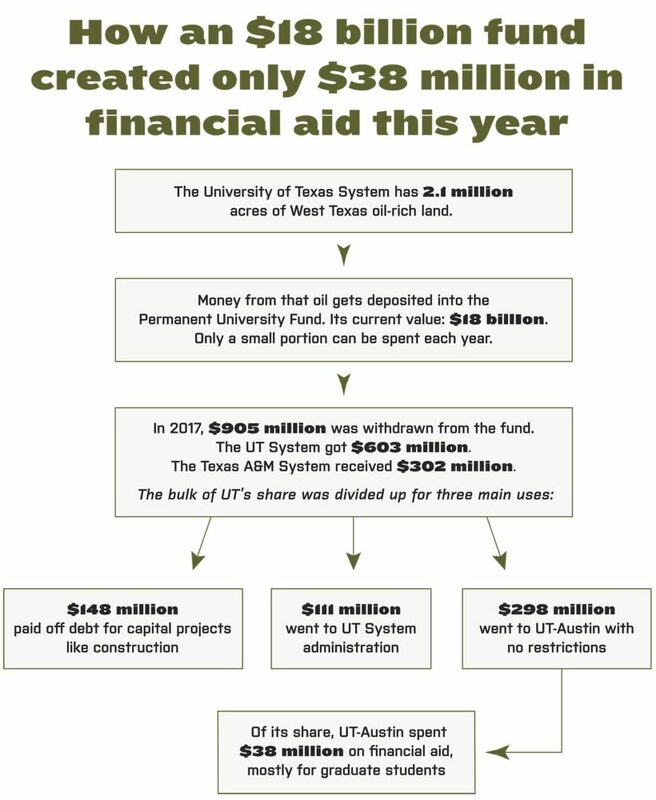 And they would make heavy use of the UT System’s cut of the oil fund, which by then had grown to $544 million. 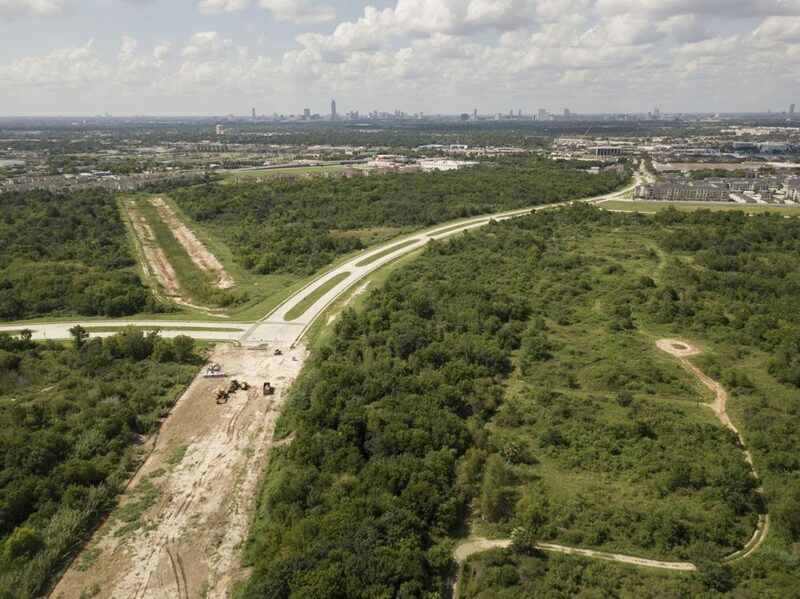 None raised more eyebrows than the last Quantum Leap, which was also among the most expensive — a plan to expand into Houston by buying hundreds of acres there. The University of Texas System bought more than 300 acres of land in southwest Houston for $215 million. It now plans to sell the land. 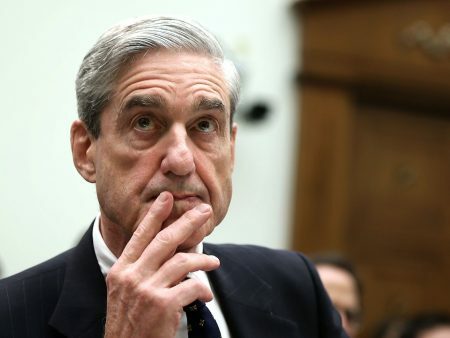 “I hope your bold gamble in allowing this old sailor to lead this great institution will be a winning hand,” he said. The boardroom burst into applause, and McRaven got a standing ovation. Regents were just as thrilled, if not more, than they had been by Cigarroa’s own nine-part vision four years earlier. And just as before, they gave their new chancellor tens of millions of dollars from the oil fund. But outside the room, the Houston plan was a surprise. Many state legislators learned about it from the news, or from an e-mail sent right before McRaven’s speech. Houston lawmakers were furious, fearing the new campus would bring unwanted competition to the nearby University of Houston. In the following weeks, McRaven received a cascade of requests from legislators urging him to slow down the process. But he didn’t. In January 2016, just three months after McRaven announced the Quantum Leaps, the UT System closed on the first 100 acres. It would eventually secure more than 300 acres at a cost of $215 million, all of which would come from the oil fund. The criticism mounted. During public hearings, legislators pressed for more details about McRaven’s plans for the land. McRaven repeatedly insisted he didn’t have any yet. Meanwhile, lawmakers were pondering another round of major cuts to higher education funding — and they wanted to know more about how the UT System was spending its oil money. 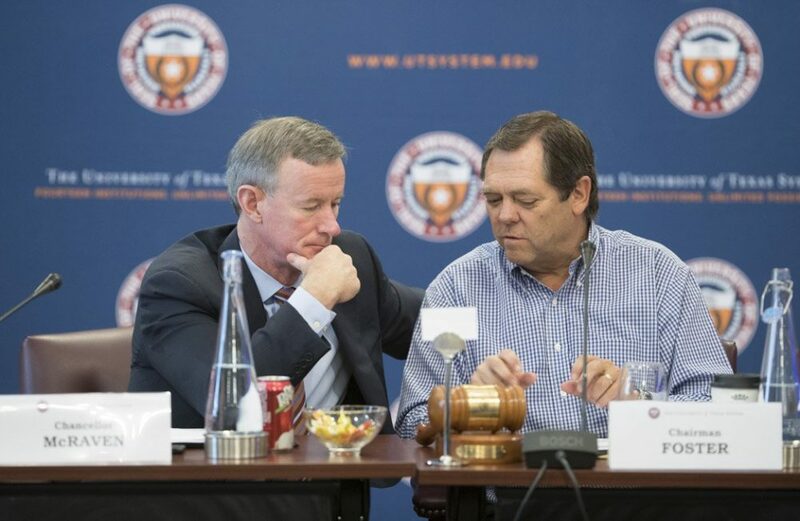 Tensions peaked this January, when McRaven told members of the Senate Finance Committee that the hundreds of millions’ worth of cuts they were considering would have a “potentially devastating” effect on the UT System. Lawmakers eventually backed off on the cuts, but that day the senators weren’t sympathetic. “I don’t think you give a damn what the Legislature thinks,” said Sen. John Whitmire, D-Houston, practically yelling. He said he couldn’t believe McRaven was complaining about state funding cuts while spending hundreds of millions of dollars on empty land. Senators had other examples of what they called unwise spending from the oil fund. They questioned the $1.5 million McRaven wanted to spend on studying how to brand the UT System. And they complained about the $141 million office tower in downtown Austin, which had been approved before McRaven was hired. McRaven pushed back again. He pointed out that the new office tower would save money by consolidating the system’s staff from five buildings into one. He added that the state Constitution places limits on how the oil money can be spent. But the tide was turning against him. The same day as the tense committee hearing, lawmakers appointed three new UT regents, who promised they would tell system leaders “no” when administrators pursued projects that weren’t in the best interests of the state. Within weeks, McRaven changed his mind on the Houston land. In a hastily called press conference on March 1, he announced that the tract would be put up for sale. “I was unable to build a shared vision for moving this project forward,” he recalled recently. Several other regents agreed that the system administration needs to trim its budget and cut staff. The board’s chairman, Paul Foster, promised to comb through system spending for possible savings. The first changes could come as soon as this week when the regents approve the system’s 2018 budget. “This is all about the students, and we’ve got to make sure that we never lose sight of that,” Foster said. UT System Chancellor Bill McRaven chats with Board of Regents chairman Paul Foster during a July meeting. In written comments to the Texas Tribune, McRaven rejected the idea that the UT System has grown too big. Much of its increased budget, he said, has been the result of efforts to lower costs at the university level. For instance, he said the system has spent tens of millions on software licenses, property insurance and digital library services that otherwise would have been paid for by each campus. He also said many of the new staff were hired to ease burdens for individual campuses. Many of those initiatives were implemented before McRaven took over. 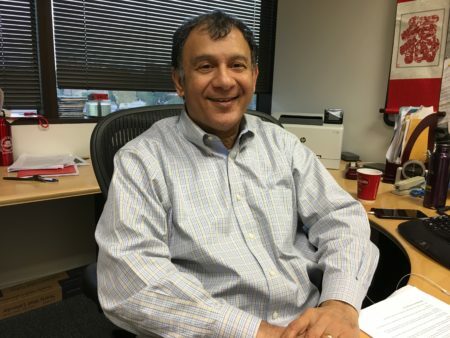 Cigarroa, who signed off on many of them, said they were attempts to keep tuition down at campuses other than UT-Austin, since state law prohibited those schools from receiving cash from the oil fund. “To actually save money on [those] campuses, you have got to start thinking a little creatively,” Cigarroa said. Not all of those moves were successful, however. In 2014, the system committed $31 million per year to centralize audit and IT services in hopes that the savings would allow campuses to keep tuition flat. 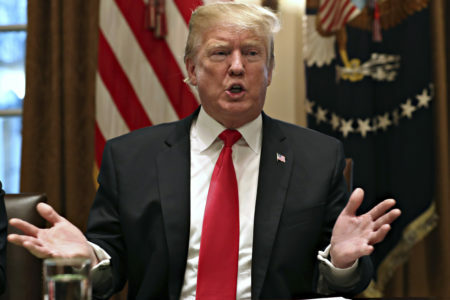 But the budget for those projects grew by millions because of problems with the IT transition, and the auditing consolidation proved to be a failure. The system decided in May to return the auditors to the campuses. Overall, McRaven said the system has an “excellent track record” at saving money for the campuses through consolidation. But regents are pushing for more of the oil fund to go directly to UT-Austin. Last month, they instructed McRaven to redirect $26 million from the system to the university. That means UT-Austin can expect $338 million in oil money for the upcoming school year. It’s unclear if any of that new money will go to financial aid. UT-Austin officials say they prefer to use their oil funds to raise the school’s stature by hiring new faculty and promoting research. The oil money only makes up 10 percent of the school’s revenue, and administrators say they use other sources of money to provide financial aid to students.